Turkish rabbi and liturgist of the seventeenth and eighteenth centuries; born in Jerusalem. He was a pupil of Moses Galante (the younger), whose "Zebaḥ ha-Shelamim" he brought to Amsterdam, where it was printed in 1708. 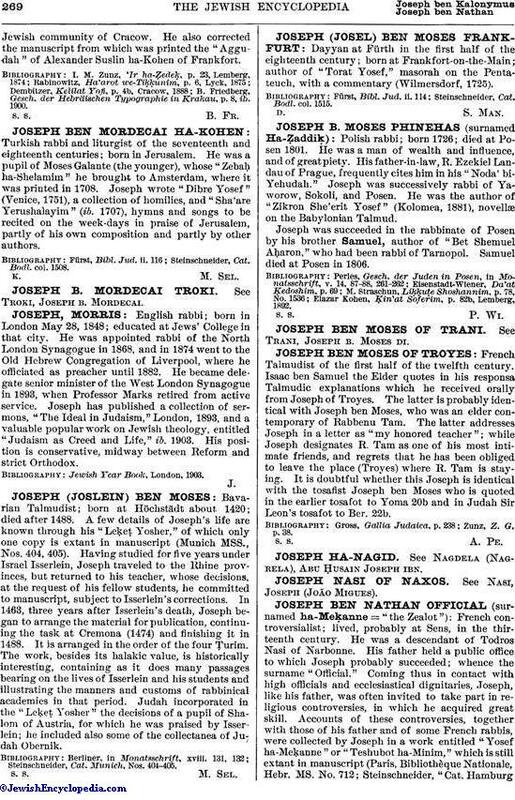 Joseph wrote "Dibre Yosef" (Venice, 1751), a collection of homilies, and "Sha'are Yerushalayim" (ib. 1707), hymns and songs to be recited on the week-days in praise of Jerusalem, partly of his own composition and partly by other authors. Steinschneider, Cat. Bodl. col. 1508.